I bought a used Amplifi 150 to quickly get the tones I needed for a show. Used it on a gig and the amp burnt out after the 3rd song. It was working fine before. Lucky I had a more reliable Gallien Krueger as a backup along with a Boss multi-effects pedal. 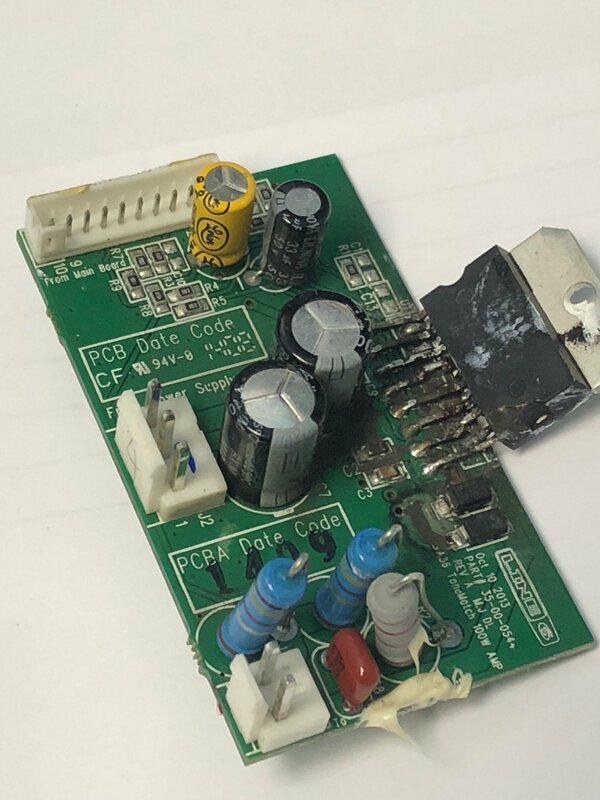 Turns out, the main PCB burnt up. Very easy to see and access behind the rear panel. I called Full Compass who say on their website they have one in stock. I call and they do not have it in stock saying they have to order from Line 6 with no ETA when they will receive it. So I called Line 6. I'm told they have one in stock, but I have to order from a service center or send it in to a center for repair. Local repair centers are asking $100 to $200 labor to replace a board. Really?? I live not far from Line 6 and I have to order from Wisconsin to get just the PCB and wait almost a month to get the part? I call local service centers and get voicemails, or "We don't know the price, but will call Line 6 and determine a price for you" Really? Yamaha was not like this. You could call them, order a part, and go to Will Call, and not miss your next show. I was going to use the Amplifi to quickly emulate artists' songs as I do many tribute shows in different genres. How hard is it to pick at least one place geographically to order parts if Line 6 does not have the resources to do so? Okay, over 2 hours passed when calling GPS Service about ordering the part I need. Once again, not far from where I live. They tell me I have to EMAIL them to INQUIRE about the part availability. Okay, so I email. I called them back after not hearing anything over 2 hours. The guy says, "We are working on it right now and will get back to you when we hear from Line6." Yeah, right. Still waiting. Line 6, I am done. Some of us are professionals and need service today, not next week or next month. Maybe I sound like an impatient brat, but business is business, and performances have to be done. If you want me to place an order, need full payment part + tax + shipping. Wait!!! When I called Line6 yesterday, they said they had the part in stock. Why a 3 week turn now? For $160, plus tax, and shipping? Full Compass sells it for $125 with free shipping. But they are out of stock and cannot say when they will get the PCB from Line6. So, either way, it will take a month to get the part. Sad, very sad. Sorry Line 6. I threw the amp in the garbage. Once again, I tried to give your company a chance. And just like the Spider amp that failed on a gig, The X3 Live that failed on a gig, and the HD 500X that failed on a gig, I cannot recomend your products or give you any more of my money. After talking with some former Line 6 employees and testers, I am told the staff at Line 6 has been cut down considerably. This explains the lack of proper customer support. They have less than half the staff they had back in the days when Line 6 was stellar in innovation, quality control, and quick to respond to problems for the amateur and professional musician. Time will tell how long the current state of business will go on. For now, it seems the bean counters are in control. Well, my buddy who also bought an Amplifi 150 had the power supply go out. I tried to help him by calling Full Compass on August 10th who said they did not have one in stock, they called Line 6, called us back, and said Line 6 would ship the part to Full Compass that day. So on August 10th, we paid for next day shipping to save time. After 7 business days, heard nothing from Full Compass and sent an email. The reply said Line 6 was shipping that day (August 21st). Today is August 28th, nothing. My friend says he will do what I did if the part does not arrive by Friday, August 31st: Throw the amp in the garbage, get a refund paid to Full Compass. Not acceptable to wait that long. Well, the part arrived today. So let's see: 19 days, or 13 business days to receive a part that we paid to ship overnight after being told it was in stock at Line 6. Took 5 minutes to put the power supply in, and the amp is working again. Saved $200 in labor costs, plus the $100 markup on the part from a local authorized service center. Plus, did not have to wait 30 to 60 days. with no Breaker or fuse.How can a company associated with Yamaha do this!